When a loved one passes away, becomes ill or is removed from a residence, the family is left with the task of packing, sorting, cleaning up and making many important decisions. This can be overwhelming and very time consuming. Our Rescue team can help eliminate this time consuming work for you and make this transition for your loved one, much easier. We find that in many Estates there are collections dating back decades. Items are packed and stored in attics, storage sheds and garages. Many times the attic and garage have been used to store items for many years and are completely full which would take a family weeks to sort through themselves, where our team can finish in just days. Sometimes families come across unknown or hidden situations where the occupant was a compulsive shopper, packrat, object hoarder, food hoarder or even an animal hoarder. Hoarder Rescue can comb through all items to help ensure that nothing of sentimental or monetary value is discarded. We can help you determine what items should be donated, thrown away or sold. This sorting process can be absolutely overwhelming for family members, but with the help of our knowledgeable staff at Hoarder Rescue, our team can swiftly complete this tedious job for you. There is no job that is too big or too small! We can clean out the entire home or adjust to your specific situation with a custom plan. Please call us for your free estimate and a perfect plan specific to your needs. 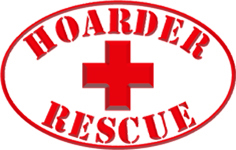 Contact Hoarder Rescue for a free estimate.